At a recent auction, we purchased a few Native American items from the former museum in Two Harbors, MN. Among them, this seemingly unusual combination: A Native American Peace Medal on an Independent Order of Odd Fellows (IOOF) collar. This was not the only set; there were a total of three of these collar/medal sets. While one doesn’t normally think of Native Americans as Odd Fellows members, apparently it was a popular custom item in this area, anyway, for Native Americans to wear and display all honors. The IOOF collar is beautiful in and of itself, with it’s decorated red velvet trimmed in twisted-metal fringe and tassels (one tassel is missing). The collar is secured by three oval chain links. The shape and materials date the fraternal cerimonial collar to the end of the 19th century. But the medal which hangs from the collar’s links is even more rare than the collar. The medal is an Indian Peace Medals , presentation pieces to Native American or Indian chiefs as a sign of friendship. The series began as an idea in 1786, but were first produced during President Jefferson’s administration in 1801, with Jefferson Peace Medals designed and created by John Reich. Because the medals were given to significant members of tribal parties, the medals became sought after symbols of power and influence within Native American tribes and are commonly seen in Native American portraiture. Most of the genuine Indian Peace medals awarded by the U.S. Government were made in silver and were issued holed or looped at the top, so the medal could easily be worn. (If a medal is not holed, and shows no sign of being looped, it is most likely a modern copy.) However, the Peace Medals were also struck in other metals, including copper. Starting around 1860, some of these were struck from the same or similar dies, for collectors. These copper pieces are known as “bronzed copper” because they do not look like copper coins. But given the popularity of the medals and the respect they conveyed, the Native Americans and traders also made or commissioned copies, in copper or silver-plated copper, of the Peace Medals too. These pieces are still over a hundred years old, yet even when produced by the US Mint, these medals are not considered “originals” as they were not awarded by the U.S. Government. 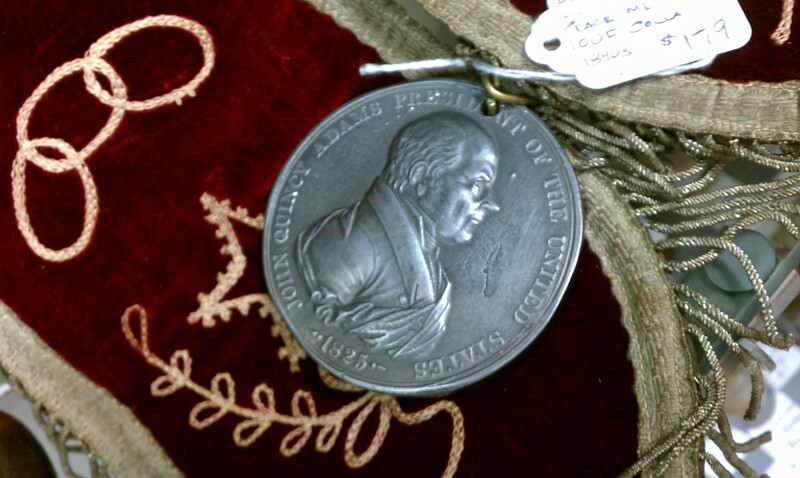 Our Peace Medal also appears to be the first design issued, as later variations do not have the fabric drape about the bust of the president, nor the year centered beneath the bust. The president’s bust on the obverse was designed by Moritz Furst, but the reverse is the same one the Jefferson medals. (This back design was used until the Millard Fillmore medals in 1850, when the reverse was changed. The reverse was changed again in 1862, during the Lincoln administration.) Interestingly, the Adams Peace Medal with the 1797 date was made later. I’ve made some inquiries regarding this antique set and will update you as I learn more. Meanwhile, the set is in our case at Exit 55 Antiques. UPDATE: In trying to find definitive information on this peace medal, I made multiple calls to auction houses and, per their recommendations, to companies which grade coins and other medals. Few seemed to know what I knew, or were willing to divulge what they did know about Native American Peace Medals. So I continued my research and then made a call to Rich Hartzog of AAA Historical Americana, World Exonumia. Rich seems to truly be one of the few people who knows — really knows — about Native American Peace Medals. I’d call him an expert. During a phone conversation, Rich confirmed the “soft medal” version of this medal, but ours does not seem to be one of those. He clarified regarding the copper medals; while made for collectors, they are considered original peace medals — but are not presentation pieces given to chiefs and other leaders. And, finally, we determined that our peace medal is likely a more modern copy. 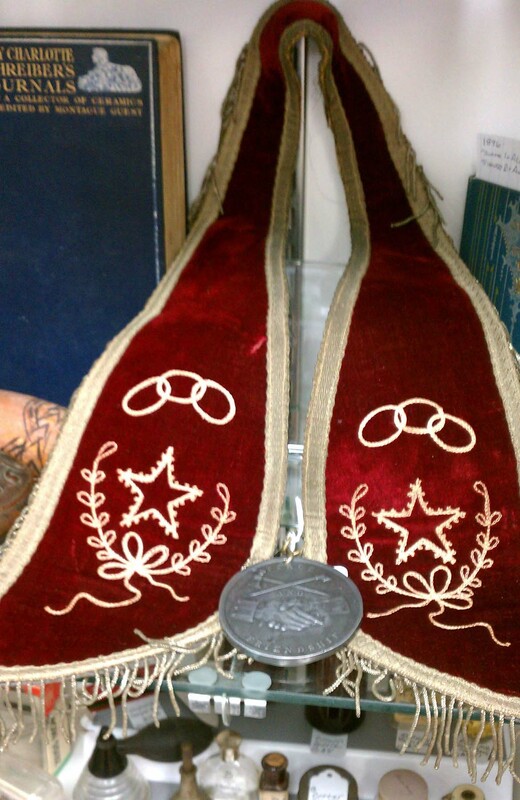 It wasn’t just that the medal is made of pewter, but the fact that the medal is attached to the IOOF collar or baldric. Seems roughly five or six years ago someone began setting the copies of peace medals on these collars. Such medals still have a modest value; Rich says roughly $20-$40, compared to the hundreds and thousands of dollars originals bring. While this may be a disappointment to hubby and I, I have learned a lot about peace medals — and learning is a huge part of why I love this business. I don’t mind admitting that I’m unsure of what I’ve found. In fact, I love researching, including asking people who specialize and know more than I do. This Friday, Stack’s Bowers Galleries will be selling a rare gold coin that invites a strong Stanley Kowalski imitation to say its name. The “Stella” was a ‘pattern coin’, a sample design minted in its intended form for the purpose of evaluating its monetary usage. The Stella came out in 1879, in the unusual $4 denomination, as a hope of improving international commerce. Through the 19th century, currency had been slowly evolving from being valued by a coin’s weight in precious metals, to simply the denomination stamped on the front. Coins were still made of precious metals, of course, but as the ease of international travel shrunk the world, the wide variety of international currencies made it difficult to take your U.S. gold coins with to Europe and trust an easy or reliable exchange into the local funds. The time was also one of other changes. The Metric Act of 1866 authorized the metric system as a legal system of measurement for transactions in the U.S., following the lead of many European countries. Ounces, rather than grams, were still how American money was measured, complicating things. About that same time, European countries were attempting to standardize their currencies in the proto-Euro Latin Monetary Union. Each country’s coins were close, but not quite a even trade, and some were silver, some gold, so the hopes were that a single common currency could help facilitate inter-country transactions. The U.S. hoped to get in the game as well, by producing its own coins that overlap with the standardized European money. Through the 1860s and 1870s, a few varieties of coins were proposed, but in the mid 1870s Iowan John A Kasson, one of the promoters of the Metric Act of 1866, found a reasonable overlap between a European coin and the American dollar. The eight florin Austrian gold coin, the equivalent of twenty francs, was just under $4 U.S. in value. Kasson’s plan was to mint a $4 coin, whose value in precious metals would be listed on the coin’s face in metric weight, for the purpose of international trade. Two designs were made of the Stella: a “flowing hair” version, like the one in the Stack’s Bowers auction, and the “coiled hair” design, which is rarer. The “flowing hair” Stella was designed by mint artist Charles E. Barber; the “coiled” by George T. Morgan. Both designs were quite similar, and both shared the same reverse. The reverse design is what gives the coin its name: the center of the coin is filled with a large star — a “stella” — thus giving the coin a casual name, like the “eagle” gold coins which came as portions of $10. Being worth $4 means it could be divided in fourths into smaller denominations, like a dollar and the $10 gold eagle were. The Stella started out as a small mint run to show the size and weight of the coin to the officials who would evaluate approving the coin. The Stella never made it into production, in either design, but as was the custom of the time it was possible to request the U.S. Mint to produce pretty much any design it had dies for, for the cost of precious metals and seignorage. The Flowing Hair Stella was used to produce about another four hundred coins at the request of various politicians, and those are the most commonly seen Stellas today. Identifying the difference between the pattern Stellas and the collectible-run Stellas is difficult for the non-expert, but there are a few clues. The pattern Stellas are much more exact in weight, and are of a much higher quality striking than the second run of coins. The second run coins vary in weight a bit, and many have some visible striations, a ‘grain’ in the metal, left from the manufacturing process of the original planchette that was struck. The Flowing Hair Stellas also often have a bit more wear, because they were passed around by the politicians who purchased them (and legend has it that many of the coins found their way into the jewelry boxes of D.C. madames). The Stack’s Bowers coin is of very high quality, but they do not specifically say whether it was one of the original pattern strikes or a later minting. Posted on June 25, 2012 June 23, 2012 Author DerekCategories Office & Den, The Hobby Of CollectingTags coin collecting, gold coins, numismatism1 Comment on Stella?!? STELLA! All I know of A Game of Thrones is that the series, which I cannot watch due to a lack of HBO and/or time to devote, looks totally awesome. As with most stories with a devoted set of followers, the replica-makers come up with some pretty amazing stuff. A small mint has produced a set of Game of Thrones money, and I was particularly taken by the Dothraki Puli. This is a “chain” of coins, minted from a single strip of precious metal and designed to be left together as one piece of money, or cut off smaller denominations as needed. I was surprised to see the note from the maker, which says these coins were based on a Russian coin style that was used for nearly a millennium. The common method for minting a coin is to start with a planchet or flan. This is a disk of the right size and weight for the intended coin, punched from a rolled-flat sheet of precious metals or cast from a blank mold. The disk is then placed between two dies, and are pressed or pounded to leave an impression of the obverse and reverse on each side of the blank. This tends to be more accurate for creating uniform size and weight of coins, although sometimes in the past the coins were cast with their fronts and reverses from the start, but that varied and depended on the material. Bronze, for instance, was a bit too hard for die striking and were cast entirely. Beginning around 980AD, minters in Russia came upon a novel method of minting coins. They found that it was easier to control the uniformity of thickness and quality by starting with a wire of the precious metal, then cut it into lengths of the right weight, and then strike the coin from those wire chunks. Although the wire was flattened before the die striking, it gave the ‘wire money’ a unique look, oblong with obvious blunt ends were the wire had been cut off. This unique shape earned these coins the name ‘fish scales’ in the Russian language. The simplicity of the process kept it in use until the 17th century and the introduction of modern minting processes, and the last of these coins were made in the early 1700s. You’ll note that this is quite a bit different than the fanciful Game of Thrones coins above, which retained their wire-like form. Actual minters and financiers would realize a large flaw in the Thrones money quite readily if it were ever used in practice. The weight of a coin in precious metals is something that requires uniformity to ensure that the coin can be trusted to be an accurate payment. “Reeded” edges on coins are designed to foil coin-shavers, people who cut off small amounts off the edges of coins to collect the precious metal and then spend the now-smaller coins at face value. Now, take a look at the Game of Thrones coins. If you were to pull out your string of wire money, you could snip off the requested denomination slightly smaller than needed, and hope that the merchant doesn’t check the weight. Then, you take the extra-long end you just made, and trim it off a little smaller than it should be, too. Do that enough, you get to keep a bunch of the copper or silver while shortchanging the people you do business with. Even the ‘pieces of eight’ were not commonly actually cut into eight pieces, at least not in common money dealings. I suppose, on far-off Westeros, they may have a different way of dealing with these fancy currency, but here on Earth we’re less trusting of hand-cut coins. Although the Shire Post website doesn’t currently have any of their wire coins for sale, real antique Russian wire coins are actually quite plentiful, and can be purchased many places for just a few dollars each. 18th Century US coins are quite difficult to find. The Mint wasn’t even established until the 1790s, and until that time coins were minted from precious metals by foreign countries or private mints, and valued based on weight. Ephraim Brasher was one of those early minters, and in 1787 he created what we call today the “Brasher Doubloon”. Weighing at about an ounce, just the gold in a Brasher Doubloon would be worth over a thousand dollars just by weight, but the rarity of coins from that era drives the value up. Just last month, one of Brasher’s Doubloons was sold by Blanchard & Co for a record-setting $7.4 million dollars. This particular Brasher Doubloon is the rarest of the seven known to exist. The other six Doubloons are marked with Brasher’s ‘chop-mark’ on the wing, but this coin, known as the DuPont Specimen, was stamped in the center of the coin, over the eagle’s shield. Aside from being one of the rarest gold American coins know, this particular coin has had an adventurous life of its own. On October 6th, 1967, thieves stole the Doubloon, along with many other valuable coins, from the collection of millionaire Willis DuPont. Although many of the coins were not recovered for many years, the DuPont Brasher’s Doubloon was recovered only a year later during a sting operation in Miami. Since then, this Brasher Doubloon has been living a quiet life, exchanging hands a few times, and increasing in value with each sale. It doesn’t make it the rarest or most valuable of Brasher’s coins, though: Brasher also made a Half-Doubloon, of which only one known example exists.